Feeling the inescapable lure of self-expression, Judy Kang has focused her considerable talent towards writing, producing and recording her self-titled debut. Described by critics as Grimes with a Stradivarius, Kang describes her record as nostalgic, psychedelic, sweet and trippy. 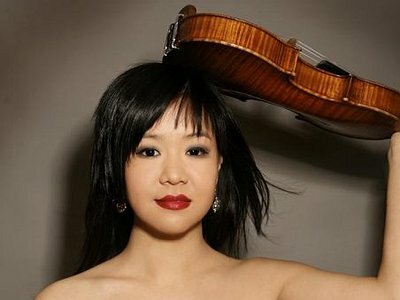 At the age when most people are still figuring out basic motor skills, Canadian Judy Kang picked up a violin and started playing what she heard. A prodigy in every sense, Kang has acquired a long list of accomplishments, awards and opportunities, not the least of which was the loan of a 5 million dollar violin. Kang was awarded the loan of the 1689 Baumgartner Stradivari violin from the Canada Arts Council. Having performed with an orchestra at age 6, graduating with a Bachelor of music at age 17 and then going on with a full scholarship to get a masters at Juilliard, Kang has worked with Pierre Boulez, Ryuichi Sakamoto and Lady Gaga. I began writing in my teens; songs, violin and piano pieces. Producing was something that I wanted to do for a while and when the opportunity kinda presented itself, I delved in. The more I think about influence and inspiration, I discover that there are certain characteristics and preferences that are in a sense engrained. When I see, hear, or experience something externally that either resonates or doesn't, that in itself influences, provokes, or triggers some sort of reaction. I was a sensitive kid and I observed every little thing so I was influenced by probably everything in some way. I was given the opportunity to live life as an average kid would, with enough exposure to enjoy my childhood for which I am thankful. Not living sheltered I believe, has contributed to my diligence and adventure for constant discovery and fearlessness. Being an only child gave me a lot of alone time to broaden my imagination. I lived and experienced many stories and lives inside my head. I think actors and acting was a huge inspiration for performing. My teachers obviously influenced me for better or worse. I had some wonderful mentors that gave me a lot of freedom to develop as an individual, sometimes to extreme extents. I also had very strict disciplining that was at times challenging but helped with building character, and seeing things in new ways and perspectives. I watched videos and listened to recordings of violinists of the early 20th century and would improvise or imitate what they played from ear. To this day, I still love that old school nostalgia and flavour. When it comes to pacing of phrases and breathes, tone, and slides, I feel so close to that style. Every moment is an important step in development for sure. I look back sometimes and even in situations that I would rather not go back to, I take what I can in helping me move forward. I find random moments like being in transit or in my bed, or in the shower are when I often have revelations or the "ah" moment for a solution to a random phrase, idea, melody, or inspiration for a melody. Playing in many different and sometimes challenging environments from playing outdoors in the countryside of Africa in 90 degrees weather, to playing Carnegie Hall, to playing on an electric violin in a packed arena of 20,000 screaming people, has definitely kept me on my toes. I've also been privileged to have worked closely with some truly great artists. Working with different people cultivates my musicianship in so many directions. Completing my self-titled album from scratch and performing my own compositions was a jumpstart in pushing me into creativity, self expression, producing, working with technology and new types of gear and instruments, and doing most of this independently. I think the ability to patiently notate an entire song is my challenge. I've never written out any of my songs except for a few. I have found it difficult mainly because I have to play and record whatever comes to me right then and there. I know that my songwriting/compositions will be shaped and developed in different ways depending on my approach, so I am excited to try out different concepts. Improvised writing vs. written out. It's different for each piece. As an instrumentalist, I usually would hear harmonically and start with chords and love cool progressions. Other times I will start with a beat and let it take me where it wants. Ever since I started to feel the melody in my vocal chords and throat, I began singing melodies or hearing them more distinctly. Yet, I wrote songs where it would be the last layer on top. I believe a lot of composing is a more thought out and slow version of improv in a sense. Composing should be organic so I don't see the two as separate entities. I think sound and space are necessary for each element to exist. I believe the two are of equal importance. A composition exists with all the elements and is a constant variable as it relates and interacts with both sound and space. A composition can be perceived distinctly and individually as it is processed into its perceiver's senses, soul, and body as a piece composed of that space. I personally believe art is what you make of it or what you want it to be. Often times, I find people relate to a song or connect with a composition because of certain bias or history and something in there resonates with that part of them. I don't mind if a person doesn't care to know a story behind any given piece and I don't respect more that someone would take the time to the read liner notes in hopes to understand. I enjoy hearing a piece and going back to it at different times in different contexts and discovering new things that I love or start to grow on me. I love music that might seem simple but where I can get lost or music that can take me to deep levels of emotion or intellect. It's also ok to challenge your audience and reach new heights. That's true intimacy. Composing is a place where no one should hide. I am strange and weird and I want you to experience it. Composing is a place where no one should hide.